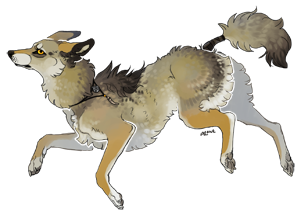 Appearance: LUPUS: True coyote, lean and sharply angled. Her high waist is one of very few signs that the girl has doggish ancestry. She has small paws and delicate limbs, with a flexible, long spine. 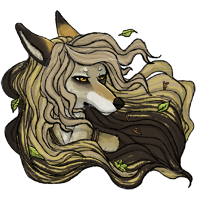 SECUI: More wolfish though otherwise still lean; Denser fur growth about her throat and chest. Her lungs are set into a deeper barreled ribcage, although her body remains overall long and lean, built for immense speed and agility. OPTIME: Thin and small, Agrippa has only soft hints of feminine curves, instead sporting an almost childish look to her build. Her breasts are small, and her hips only accentuated by a very narrow waist. She has quick, dexterous fingers and small, neat feet. 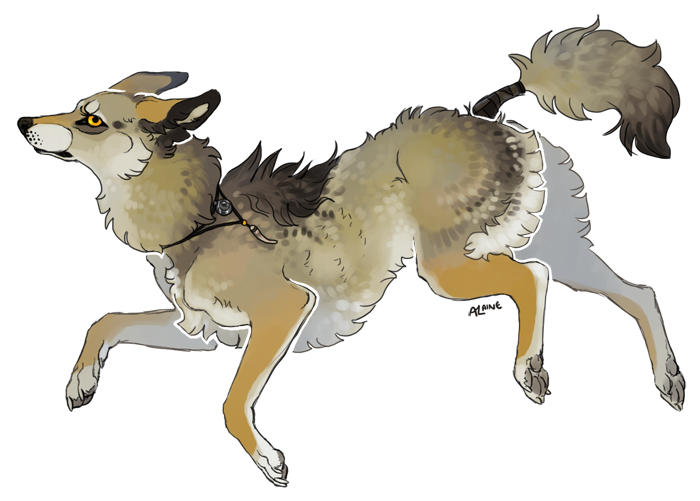 GENERAL: Of all her siblings, Agrippa looks the most like a coyote. She is, in all ways, average in this sense. There is absolutely nothing unique about her except for hints at her Lykoi heritage. Due to her rather common-place coyote coloring, Agrippa is often overlooked. She is not a particular beauty, nor is there any sense of strength or power that can be attributed to her appearance. The only outstanding coloring about her form are the girl's eyes, which are a sharp sunset-gold, the color laced with warm terracotta and jack-o-lantern orange. Overall, Agrippa has a petite build. She is the smallest of her siblings, and could easily pass as a full-blooded coyote in stature in spite of her hybrid blood. She has petite legs and a limber spine, gifting the girl with excellent agility and short bursts of speed; Unfortunately, her size limits both her endurance and physical strength. Her face is narrow and sharp, with the darker markings beneath her eyes often giving her a tired, haunted look. In all forms, Agrippa wears little adorning, preferring to keep her body free of obstructions as much as possible. She wraps the base of her tail in black bandage strips, both as a throwback to the styles of scintilla, as well as a practical way of keeping her fluffy tail from getting snagged or damaged close to her spine. The only other adornment typically worn by Agrippa are her pendants; One, a sharp tooth carved from an antler tine, and the other a representation of her faith and history. In optime form the de le Poer girl's hair is naturally long and tangled, with heavy layering and sharp bangs at the front. She will occasionally pull it back into a high ponytail, but is well used to it, and does not find it a distraction or hindrance. Seemingly curt and arrogant, Agrippa is in fact a very uncertain and emphatic young woman. She often prefers to keep her own quiet company over that of strangers, although it is less from a sense of superiority than it is a preference for her own solitary meditation. She is softer of heart than her bold larger sister, Kali, and will always offer assistance to those in need of it; she has a particular soft spot for the very old, or the very young, who are unable to defend themselves. However, the young de le Poer is not one for prolonged interactions with individuals she considers loud or brassy, and she despises those who look down on others for their perceived weaknesses. Anyone considered by Agrippa to be a 'bully' is often the target of cold, impassable hatred; And beware to those who fall on the wrong side of her bow, for they are as like to get an arrow through the eye as they are any kind of welcome. Due to her upbringing, both in the harsh wilderness of the North and then in the militaristic training of Scintilla, Agrippa does not shy away from violence or killing when necessary. As with many of the soldiers churned out on those hot sands, she is able to flick a switch in her heart to turn off her emotions and kill in cold blood. However, violence is not her natural state of being, and if possible she would rather flee confrontation than face it with aggression. Unlike her siblings, Agrippa does not have the same easy self-confidence or courage that makes them such excellent fighters. She struggles with the idea of failure, and of not being good enough, though for what or whom she is not certain. Her faith in God helps to ease some of the young woman's inner turmoil, but her dissatisfaction with packlife and the people around her is cause for many emotional difficulties. Biography: Agrippa was born a serious child, grim and quiet and cautious. Life within the harem her father and nuncle had made was strange, a world apart from the civilizations that awaited the children in later months. She grew up with a keen understanding of the forest, and the quietness in her heart blossomed into an appreciation for being alone. Unlike Marlowe and Kali, who sparred with one another from a young age, young Agrippa was small and weak and easily beaten. She preferred to slink away rather than suffer endless bruises when it came time to train, and would instead lose herself in the wilderness and her own thoughts. Always, the girl was very private, but on the inside she felt vibrant and alive when at one with nature. Her mother, Kastra, was quick to see that her littlest daughter would never become the warriors that her other offspring were destined to be, and instead she asked the goldcrow, Agrippa's father Ezekiel, for a different kind of training for the girl. From that moment, Agrippa was taught with the bow, and with other long-ranged attacks. With Ezekiel's own immense abilities with archery to guide her, and Sirius' clever understanding of daggers, Agrippa quickly became lethal in her own right. She became fiercely competitive with the bow, always pushing herself for betterment, and trained endlessly and tirelessly long after Ezekiel's tutelage had ended. Her relationship with her father was a strange one, but Agrippa idolized the man, and he in turn seemed to have an appreciation for his little daughter's wildness and devotion to her training. It was the arrival of Boreas wolves that changed everything. After the first few unanticipated attacks, Agrippa's self-confidence and sense of peace was completely shattered. She and her siblings were still children after all, and no match for the highly skilled emissaries of the northern wolf pack. For the first time in her young life, she truly knew fear; and fear was as poison to strength and courage. Soon after, Ezekiel sent his family away, hoping to draw on their attackers with Sirius, far off to the northeast. Kastra took them to the one true home she had ever known - Scintilla. For more information, please look on Agrippa's WIKI.